I enjoy working with beginners of all ages. For students who are just getting started, I see my role as more of a coach than a teacher. I help guide them through working out the mechanics of how their hands, fingers and arms need to move while playing. Learning the guitar isn’t easy, but the right guidance can make a world of a difference in the beginning. To do this, I coach beginners through learning how to strum through a series of song-based exercises that I’ve put together. 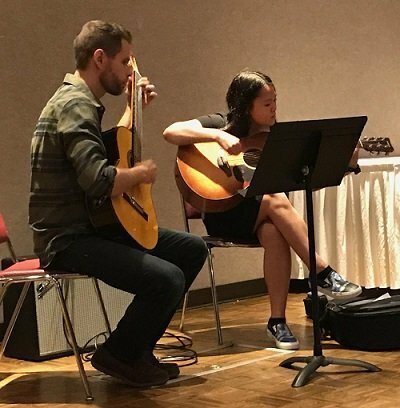 Once basic strumming ability is established, lessons could go a number of different directions depending on the student’s interests. Some students might want to learn how to finger-pick, others how to improvise and play lead guitar, while others might want to work on being able to sing while playing, and so on. If you are an adult beginner, I understand that you might feel a little self conscious or apprehensive about delving into something new. Rest assured that I’ve taught many adult beginners, ranging in age up into their mid 70’s. There is no reason to feel funny about beginning to learn an instrument as an adult. I’ve seen plenty of people do it, enjoy it, and be successful with it. Intermediate and advanced students have a great variety of things they might be wanting to improve on. I find that a lot of these types of students want to break out of a rut of some sort. Many want to deepen their knowledge of theory and other fundamentals. What this means in particular from one student to the next can vary greatly. 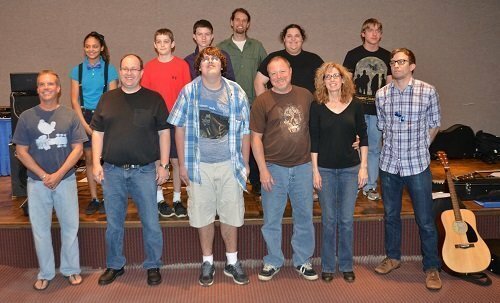 Therefore, I treat each student differently and put together an approach that balances between their personal musical interests and goals, as well as addressing gaps in their knowledge of theory or problems with their technique. That’s why I think the most important thing is for a child to enjoy taking guitar lessons. If they think of the guitar as a chore and dread coming to their lessons, they won’t progress much. So, I keep the atmosphere light hearted in lessons. I gently push a young student to improve without falling into being strict or critical. We’ll learn simple melodies that are fun to play, easy songs with simplified chords that we can sing along to, and eventually branch into more difficult chords and some note reading. The thing to remember is that a child has plenty of time to learn and improve. Cultivating interest and enthusiasm now is the top priority so that they will have a desire to continue with the guitar in the years ahead. Learning to read standard music notation actually isn’t that important in a lot of cases. There are a lot of excellent guitarists out there that don’t read, and in many situations it just isn’t that relevant. At the same time, there are certain situations and styles of playing where it can be important. I’ve written an article on my blog about my thoughts on this, which you can read here. In general, I don’t require all of my students to learn to read music. However, I’d be glad to include it in lessons if you would like it to be part of what we cover. And, if I see a need to include it based on what a student or student’s parents want to accomplish, I’ll certainly do so. I’m a decent reader myself, and have plenty of materials on hand to use in teaching how to read. I treat the teaching of music theory on a case by case basis. If a student expresses interest in learning it or if the student wants to be able to do things that require knowing theory, I’ll teach it. I have a good curriculum for learning theory put together for these types of students. However, I’m not the type of teacher who insists on learning theory. There are plenty of students out there who simply want to be able to have a good time playing songs that they like. For these types of students, knowing theory isn’t too important and there’s nothing wrong with that. There are still plenty of things to work on in lessons for these types of students: the various techniques involved in playing the songs they are learning, playing with greater power and emotional intensity, learning to play entire songs, and getting used to playing with another person are just a handful of things I focus on in this case.